The Greatest Need. The Greatest Return. Why We Put Women at the Center of Our Program. This International Women’s Day, we wanted to share our thoughts about what empowering women means to us, and to the world. 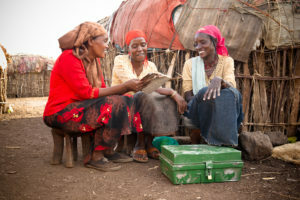 Since we started our resiliency-building poverty graduation program in the drought-stricken regions of eastern Africa, The BOMA Project has focused on women. Why? Two reasons. The first is that women—and children—disproportionately bear the burden of the cascading effects of extreme poverty. So there is the greatest need. Second, data has shown that women reinvest up to 90% of their resources back into their families and communities. So there is the greatest return. That is why women are at the core of our program. We simply cannot solve one of the world’s greatest problems—poverty—by excluding half of the world’s population. Employing rigorous data collection and evaluation, we know that our program works, and we know that it has the potential to have an impact far beyond individual families. Empowering women, giving them the tools to forge a pathway out of extreme poverty, can solve one of the biggest global challenges facing us this century. That’s why women. And that’s why we thank you for your support, this International Women’s Day. And every day.